Crystal, Crystal AB, White Opal, Light Rose, Vintage Rose, Rose, Rosealine, Fuchsia, Silk, Light Peach, Padparadscha, Ruby, Burgundy, Siam, Light Siam, Garnet, Indian Red, Jonquil, Citrine, Topaz, Copper, Chrysolite, Peridot, Erinite, Khaki, Olivine, Emerald, Light Emerald, Blue Zircon, Aquamarine, Light Azore, Light Sapphire, Medium Sapphire, Sapphire, Dark Sapphire, Montana, Capri Blue, Light Amethyst, Amethyst, Tanzanite, Purple Velvet, , Lilac, Violet, Smoke Topaz, Light Smoked Topaz, Light Colorado Topaz, Black Diamond, Crystal CAL, Jet. 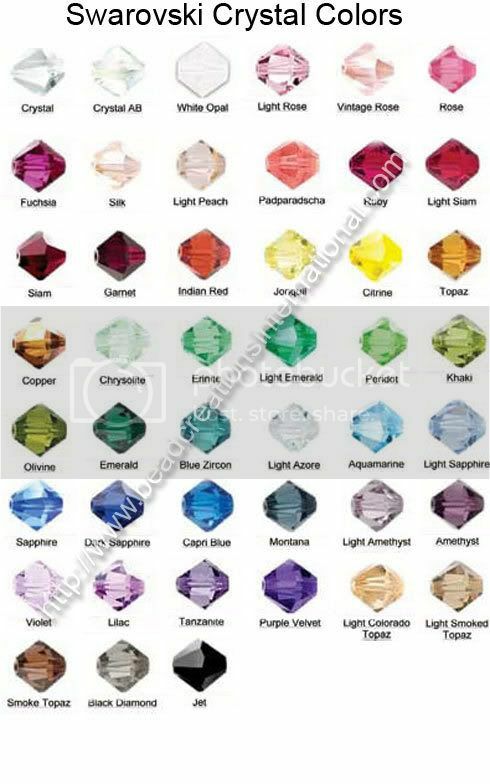 Crystal AB, Light Rose, Rose, Light Peach, Ruby, Burgundy, Garnet, Light Siam, Siam AB, Topaz, Chrysolite, Peridot, Erinite, Khaki, Emerald, Blue Zircon, Aquamarine, Light Azore, Light Sapphire, Sapphire, Dark Sapphire, Light Amethyst, Amethyst, Tanzanite, Purple Velvet, Violet, Purple Velvet, Lilac, Smoke Topaz, Light Smoked Topaz, Light Colorado Topaz, Mocca, Black Diamond, Jet. 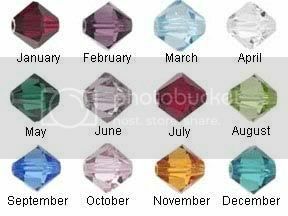 Crystal AB, Light Rose, Rose, Ruby, Garnet, Topaz, Peridot, Peridot AB, Erinite, Emerald, Blue Zircon, Aquamarine, Sapphire, Dark Sapphire, Light Amethyst, Amethyst, Light Colorado Topaz, Black Diamond, Jet. These are colors I carry in stock. Please see my list for the different sizes and colors some I carry in 4mm but not in 6mm or 8mm or vice versa.